Proprietary Name: Conju Princess Rich Essence What is the Proprietary Name? 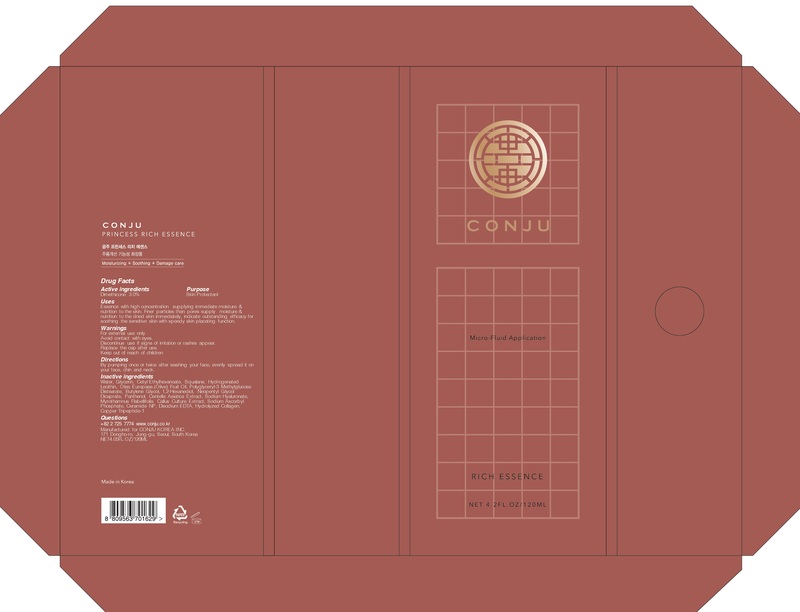 Conju Princess Rich Essence with NDC 72950-010 is a a human over the counter drug product labeled by Conju Korea Inc.. The generic name of Conju Princess Rich Essence is dimethicone. The product's dosage form is liquid and is administered via topical form. Uses:Essence with high concentration supplying immediate moisture & nutrition to the skin. Finer particles than pores supply moisture & nutrition to the dried skin immediately, indicate outstanding efficacy for soothing the sensitive skin with speedy skin placating function. Directions:By pumping once or twice after washing your face, evenly spread it on your face, chin and neck.